Volume 17 spotlights a practice area often overlooked or deemed slow-moving and stodgy by legal career seekers. Not anymore. That all changed on January 1, 2011, when the first Baby Boomer turned 65. Baby Boom demographics are unprecedented. Beginning in 2011 and not ending until 2029, 80 million have, are, and will turn 65 at the rate of 10,000 a day every day. That’s a lot of potential clients. 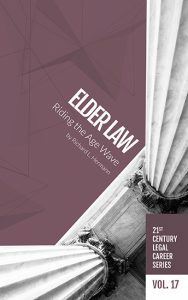 In this volume of the 21st Century Legal Career Series, Hermann provides a guide to the Elder Law practice area, which is gaining prominence, and producing career opportunities in law firms of all sizes as well as financial services companies and governments at all levels. Buy the print edition at the NALP bookstore or the electronic version.